Farrar, Straus and Giroux (BYR), 9780374303235, 320pp. Dashka Slater has written many books, including Escargot which won the Wanda Gag Book Award, Baby Shoes, The Antlered Ship, which was a Junior Library Guild Selection and received four starred reviews, and Dangerously Ever After. 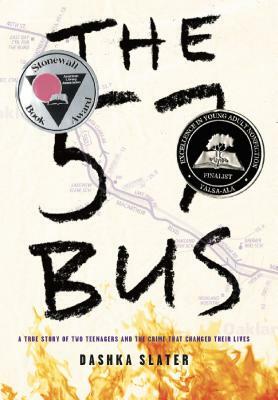 Her non-fiction young adult novel The 57 Bus won the Stonewall Book Award and was a YALSA finalist. She lives in California. Find her at dashkaslater.com. A Washington Post Best Book of 2017! One of The New York City Public Library Notable 50 Best Books for Teens! The California Book Awards Young Adult Winner! An ILA Notable Book for a Global Society! Oklahoma Sequoyah Book Award Winner! Maryland Association of School Librarians YA Nominee! The Florida Teens Read Hope Speak List Book Choice!